I’m planning on using the Java 2D API for a project this summer, but I need to get familiarized first. 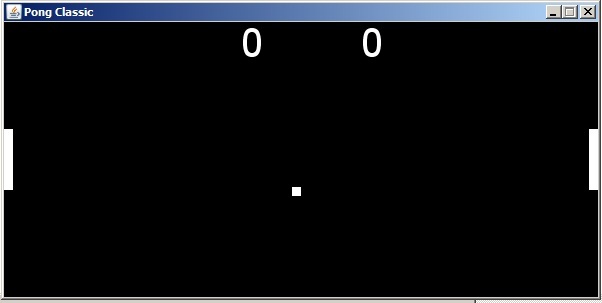 In the previous post I covered Pong on a the C32 microcontroller. Here I’ll look at a desktop implementation using AWT. A great starting point is this zetcode tutorial on game programming. The author covers a series of classic arcade games. I used their code to figure out how to initialize the Swing JPanel and handle keyboard input. The collision detection code is almost exactly the same as the C version. This version is a little more robust in that it supports arbitrary window sizes, paddle lengths/widths/speeds, and ball velocities. The only real trouble spots were devising a scheme to handle two keys being held down simultaneously and repainting the frame at the correct times. For more fun, consider modifying this version to change the X and Y speeds of the ball based on paddle velocity or collision position. Here’s the playable jar file and the Eclipse project with the source.